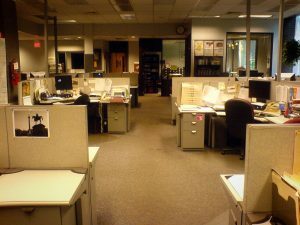 Harassment and abuse has no place in the workplace – including newsrooms. Journalists must speak up. In the wake of the scandal involving Harvey Weinstein, journalism is one of the several industries facing the reality that men – especially those in positions of power – are harassing and abusing female colleagues. Well-known political reporter Mark Halperin lost several contracts and projects after reports of sexual harassment during his time at ABC News. Michael Oreskes also resigned as NPR’s senior vice president of news and editorial director after the networked investigated his behavior toward female colleagues. Other men resigned or were removed from their editorial positions in recent weeks in the wake of allegations. Female journalists already shoulder an unfair burden of harassment from online trolls and people who lack civility. The last place they should be subjected to harassment or abuse is within the walls of their newsrooms and workplaces. The recent high-profile cases should serve as a warning to other people who use positions of power to harass or abuse colleagues, but assuming that’s enough to solve the problem would be naïve and insulting to those who are the victims of these types of behaviors. The duty then falls to the wider journalism community to help ensure safe workspaces for all journalists by calling out inappropriate behavior and supporting people who are the victims of abuse or harassment. Predators need to be put on notice that these types of actions won’t be tolerated. Journalists must also challenge their news organization’s leadership to hold people accountable for harassment and abuse. Weak responses allow predators to go unchallenged and puts more people at risk. The goal should be to rid the workplace of predators and create an environment in newsrooms where people who consider abusing or harassing colleagues are the ones feeling scared and anxious – not women and other journalists just trying to do their jobs. The hope is that these last few weeks serve as a long-overdue turning point in the journalism industry, but to make that true will take a sustained commitment from all journalists to be vocal against abuse and harassment.